Last week I asked you, my readers, to help come up with a new name for my Etsy Shop! I got some amazing ideas. Today I am happy to announce the new name. If you've been by my shop in the last day or two you might have already noticed it. 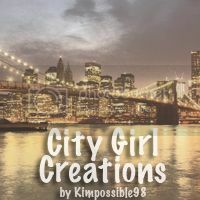 Thanks to Brittany from Yellow Umbrella I chose a variation of her City Girl Creates Idea. I was surprised by my decision not to use my name in the title but I do love it! Thank you to everyone else who helped me find a new name! Brittany is not the only winner! I am holding a giveaway for $15 store credit to my newly named shop. Help me get the word out and you could win! Stop by my shop over the next week and you get 20% off your order. Use the code 20OFFCGC at checkout. Yay! That is so exciting! I love your banner and I am so happy you found a new shop name! Infinity scarves are always great. I would probably go with the grey one, although the red one is tempting too. And a fun suggestion... you should add knitted place-mats to your selection! My mom has some, and they add such a cute touch to the table. I bet people would buy them! I love all the Infinity Scarves!! But If I had to choose one, it would be the teal and gray one! It's beautiful! 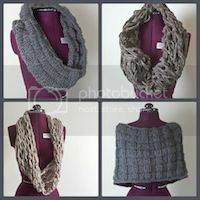 Ohh, I really like this scarf http://www.etsy.com/listing/89993019/super-soft-cozy-infinity-scarfcowl-with ! !